Your vehicle is equipped with a tire pressure warning system that uses tire pressure warning valves and transmitters to detect low tire inflation pressure before serious problems arise. Vehicles with compact spare tire: The compact spare tire is not equipped with the tire pressure warning valve and transmitters. 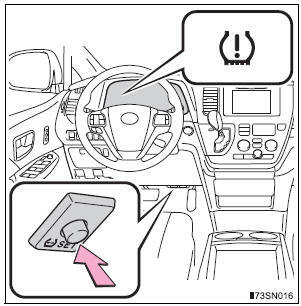 When new tire pressure warning valves and transmitters are installed, new ID codes must be registered in the tire pressure warning computer and the tire pressure warning system must be initialized. Have tire pressure warning valve and transmitter ID codes registered by your Toyota dealer. When the tire size is changed, the tire pressure warning system must be initialized. Park the vehicle in a safe place and turn the engine switch off. Vehicles with a smart key system: Wait for a few minutes with the engine switch in IGNITION ON mode and then turn the engine switch off. The treadwear indicators are showing on a tire. A tire goes flat repeatedly or cannot be properly repaired due to the size or location of a cut or other damage If you are not sure, consult with your Toyota dealer. The effectiveness of the tires as snow tires is lost. If tires not equipped with tire pressure warning valves and transmitters are used. If the ID code on the tire pressure warning valves and transmitters is not registered in the tire pressure warning computer. If the tire inflation pressure is 73 psi (500 kPa, 5.1 kgf/cm2 or bar) or higher. If a radio set at similar frequencies is in use in the vehicle. Initialize the system with the tire inflation pressure adjusted to the specified level. Initialization can be completed in a few minutes. However, in the following cases, the settings has not been recorded and the system will not operate properly. If repeated attempts to record tire inflation pressure settings are unsuccessful, have the vehicle inspected by your Toyota dealer. When operating the tire pressure warning reset switch, the tire pressure warning light does not blink 3 times. After driving for a certain period of time since the initialization has been completed, the warning light comes on after blinking for 1 minute. FCC WARNING: Changes or modifications not expressly approved by the party responsible for compliance could void the user’s authority to operate the equipment. Do not use tires that have been used on another vehicle. Do not use tires if you do not know how they were used previously. Vehicles with a compact spare tire: Do not tow if your vehicle has a compact spare tire installed. Do not operate the tire pressure warning reset switch without first adjusting the tire inflation pressure to the specified level. Otherwise, the tire pressure warning light may not come on even if the tire inflation pressure is low, or it may come on when the tire inflation pressure is actually normal. When removing or fitting the wheels, tires or the tire pressure warning valves and transmitters, contact your Toyota dealer as the tire pressure warning valves and transmitters may be damaged if not handled correctly. Make sure to install the tire valve caps. If the tire valve caps are not installed, water could enter the tire pressure warning valves and the tire pressure warning valves could be bound. These conditions may cause losses in tire inflation pressure, reducing the cushioning ability of the tires. In addition, driving on rough roads may cause damage to the tires themselves, as well as the vehicle’s wheels and body.